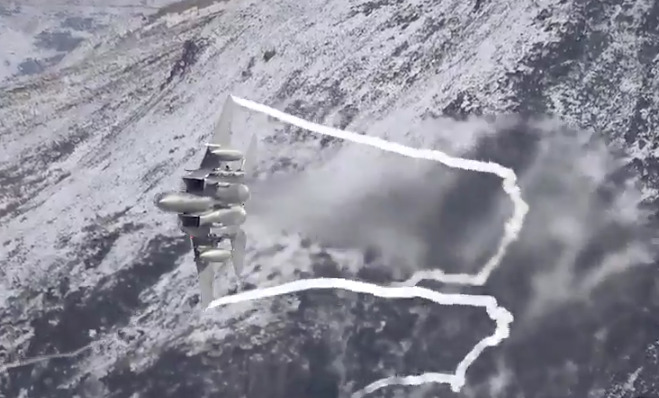 Elwyn Roberts/TwitterA F-15 Eagle passing through the ‘Mach Loop’ in Wales, February 8, 2018. The “Mach Loop” in northwest Wales provides a perfect vantage point to watch fighter jets and other aircraft blitz through steep-sided valleys at almost eye level. Earlier this week, amateur photographer Elwyn Roberts caught what appear to be US Air Force F-15 fighters from the 48th Fighter Wing based at RAF Lakenheath – home to the US Air Force in Europe’s only F-15 fighter wing – making some thunderous passes through the Loop’s snow-capped mountains. Aviation enthusiasts and photographers flock to the area, nicknamed the Mach Loop after the town at the southern end of the circuit, Machynlleth, where roughly 1,000-meter-tall mountains make it possible for all kinds of aircraft to make low-level passes. The Loop, officially called Low Flying Area 7, is one of several sites in the UK where aircraft can make passes at altitudes as low as 250 feet. Fighters and other aircraft are a regular sight. In January, Roberts caught a pair of C-130J Hercules zipping through the circuit – their wings flexing in strong winds. In August, he filmed a trio of F-15s roaring through as observers looked on. Elwyn Roberts/TwitterA F-15 Eagle passing through the Mach Loop in Wales, February 8, 2017. The Mach Loop had several first-time encounters with US aircraft in 2017. 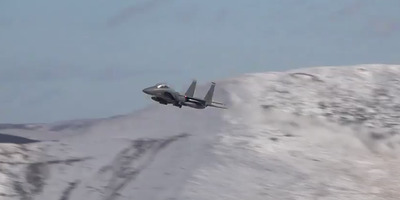 In April, F-22 Raptors, a stealthy 5th generation fighter that is rarely deployed overseas, were on the scene making passes through the Welsh mountains. That was followed in May by F-35As from Hill Air Force Base in Utah passing through for the first time while deployed to Europe. In August, a US Air Force C-17 Globemaster III lumbered through for several low-level passes, its wings briefly trailing condensation as it raced by photographers.